I’m terrible. I have not done a good job of keeping up with my travel blog. I spent a week in Iceland during Thanksgiving week in 2017 and I’m only writing about it now. I’ll do my best to recollect the trip, but that shouldn’t be too hard because it was a very memorable one. A word of caution if you plan to visit this part of the world in the winter: beware of treacherous weather. We had no clue how violent the weather could be. 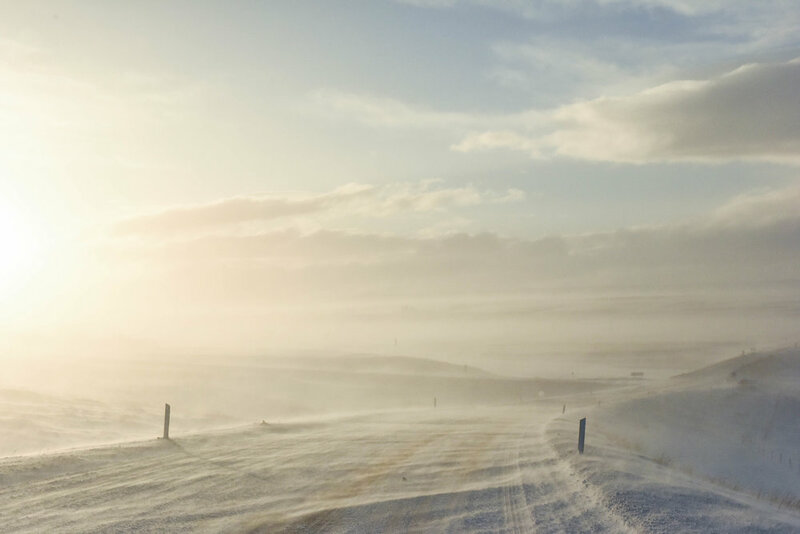 Iceland is a country accessible only by car when you get there. Volcanic activity, harsh winds, and snowstorms make subways and trains unviable modes of transportation. We rented (as many visitors do) a 4 wheel drive SUV and faced the strong winds and snow day and night. Cindy and I took turns driving and whether I was at the wheel or not, my palms were sweaty from nervousness. There were times when I felt like we would be blown off a cliff, although I would never admit it to Cindy so as not to frighten her. We drove so carefully and slowly into what looked like nothingness. The heavy downfall of snow mixed with the wind made us see only in white. Imagine driving in this at night! Needless to say, we had to make slight travel modifications, which you’ll read more about later. The country does have up to date road and weather conditions on a widely used site called road.is. It is also best to not go offroading or take shortcuts when weather is in question. To be quite honest, I’m so happy we made this trip during this time. Despite being in such dangerous predicaments, it was like being in a snow globe. It was surreal and extremely beautiful. 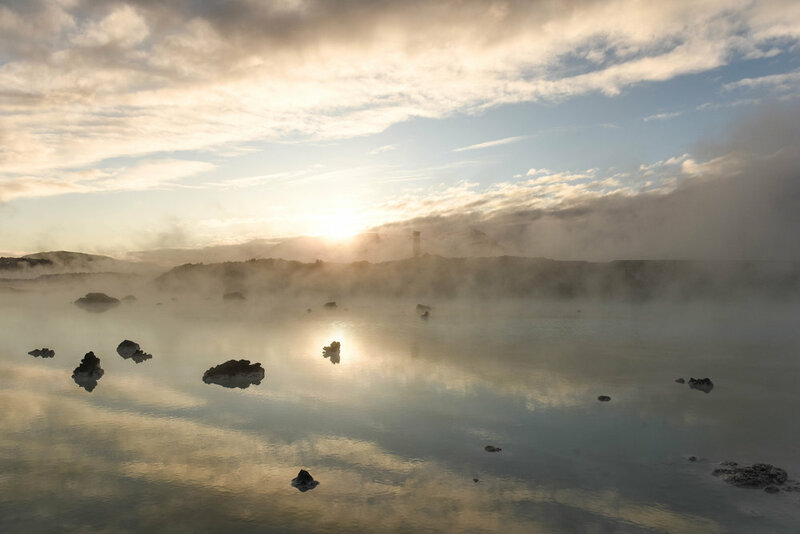 There is a popular route visitors often take called the Golden Circle, which starts from Reykjavik and loops around southern Iceland and back. We didn’t have time to do the entire route, but we visited some of the famous sights from this route. Like most people, we started in Reykjavik. Once we landed, we headed straight to the Blue Lagoon. It’s incredibly touristy, but I like to think it was less crowded than usual when we visited given the season. But we had so much fun and everything in and surrounding the area made it so picturesque. The week was filled with some really unbelievable sights but Blue Lagoon was one of the best experiences I had. 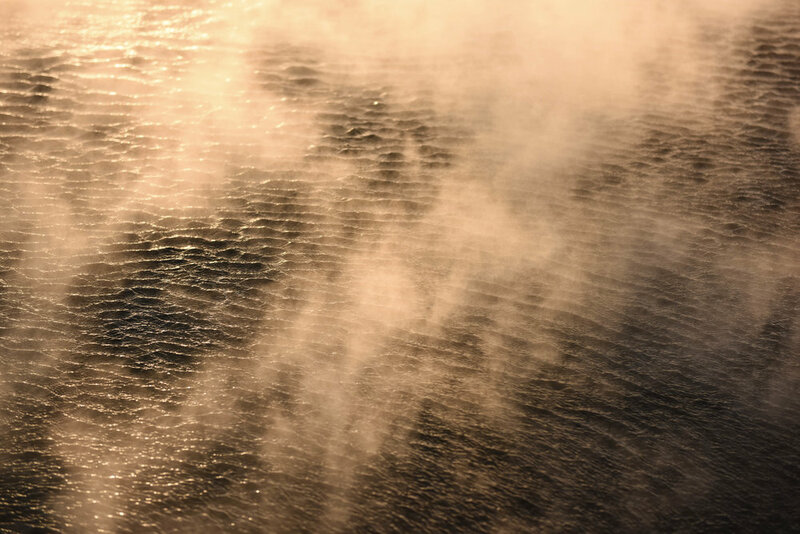 The soft turquoise color of the water and the mystical look of all the steam had me snapping photos left and right. Afterwards, we made our way to the South Shore. We did not explore the glaciers of Sólheimajökull but we did visit the Skógafoss waterfall - one of many waterfalls we would eventually see. We also ventured to Vik to see the Reynisfjara black volcanic sand beach - this was the most east we drove. I’d love to explore easter Iceland one day as I’ve heard it’s absolutely beautiful there as well. VIk is a small seafront village whose beach is made up of black pebbles and offshore rock formations. Nearby Vik, we made a short hike up to Dyrhólaey, which overlooks Reynisfjara. In Icelandic, Dyrhólaey translates to “door hill island” due to its natural arch and doorway-like hole naturally shaped by the force of the Atlantic waves over millenia. South Iceland is also home to Sólheimasandur Beach, another black sand beach. However, this beach is known for a plane crash that happened over 40 years ago. The airplane wreckage was never removed and the site has now become a tourist destination. Directions to the site can be found here. It is true what they say, it really is like a scene from a post-apocalyptic movie. Other than the horses (which I’ll get to in a bit), one of my favorite things we did in the south was hiking through the snow filled trails with nothing but snow capped mountains and frozen rivers surrounding us. It was only a short hike in order for us to reach this hidden gem: Seljavallalaug. It is a hidden swimming pool sitting in a narrow valley that only locals knew about. 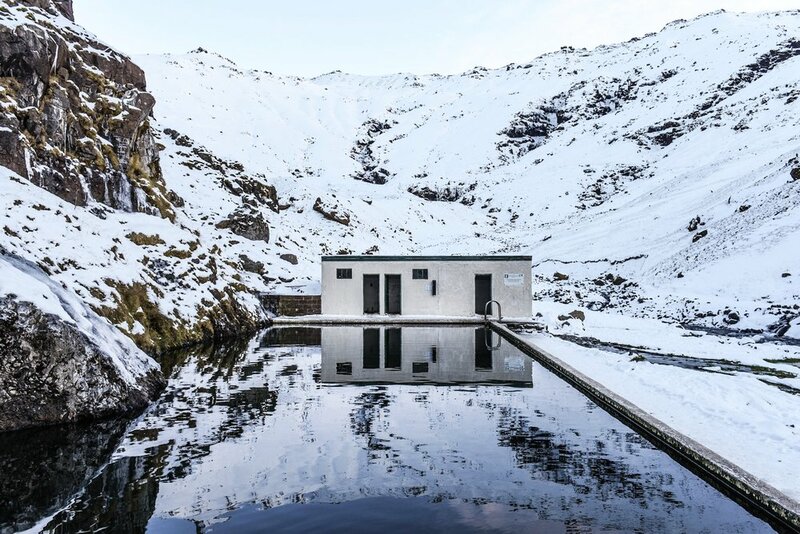 It is the oldest swimming pool in Iceland, built in 1923 and is still standing. In the early 1900s, many Icelanders didn’t know how to swim, even though many people lived off fishing. So the pool was created as a place to teach locals how to swim. Directions to this pool are here. When we were there, there was a man crazy enough to jump in the naturally heated pool (the water comes from a nearby hot spring). Mind you, there wasn’t anyone maintaining this pool at the time and the locker rooms looked very small. 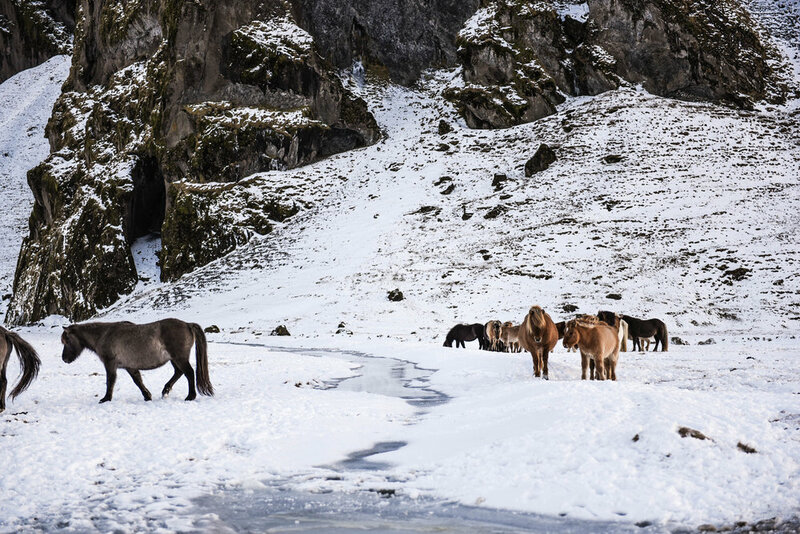 When you drive through Iceland, you’ll notice herds of horses on ranches and farms off of highways and major roads. You will see MANY of them and you will want to pull over and pet them and play with them. And guess what? You can! It was truly one of the most amazing things we did while there. As we would drive (before the storm intensified), often we would stop and pull over to take photos of the horses and to pet them and hang with them for a little a while. The first time we did this was on our way out of South Shore. I swear, we spent at least an hour just hanging out in this field filled with so many pretty horses. They let us pet them and photograph them and get very close to them. They were so friendly. 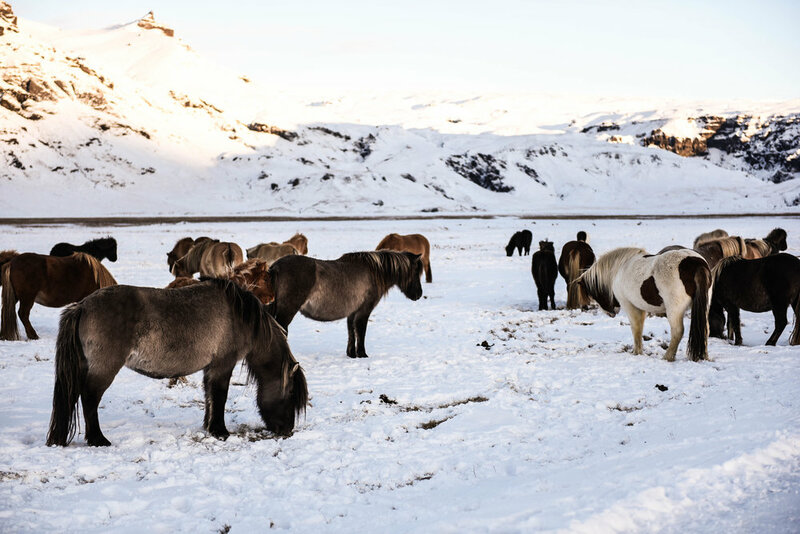 Apparently, “ponies” are an offensive term to refer to these beings because they are pure bred Icelandic horses and carry few diseases, if any. 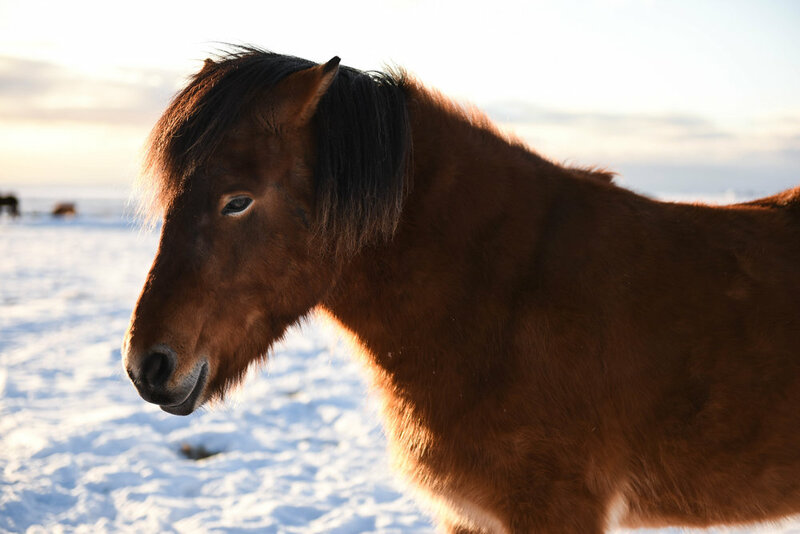 Once an Icelandic horse is imported out of the country, it cannot return for fear of mixed breeding. 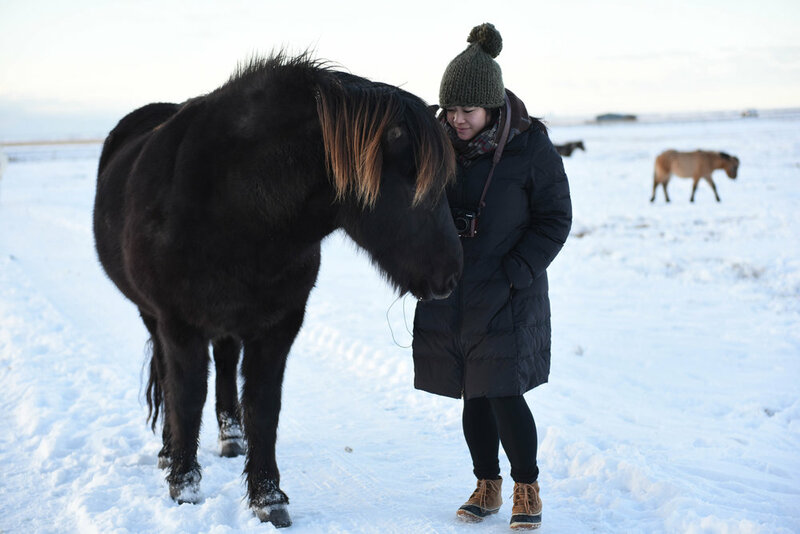 These horses are unique because they are much smaller than the ones we’re used to elsewhere and are much furrier - this coat of fur helps them withstand the harsh winters of Iceland. I hear in the sheep herding months of September, you something similar to this all over the country, but with sheep! Our next stop was to north Iceland to the small town of Mvatn. This was about a 6 hour drive from South Shore because there was is no direct route. And you have to drove over mountains to reach this area. And during this drive was when the snow storm began. Oh, and did I mention that we only got 6 hours of daylight each day? Yeah, so 6 hours of driving ended up being longer and we were scared for our life. But we got through it and as we were passing the second largest city, Akureyri, and getting back on the highway to Mvatn, that’s when we finally saw it: THE NORTHERN LIGHTS. I remember we were listening to music from the band who did the theme song to Stranger Things, so it was extra eerie. It was like looking at aliens in the sky, green lights just dancing in the dark directly above us. As I mentioned, we just got onto the highway and the snow had subsided so the dark sky was clear enough for us to see the green lights. No one else was around us - it was almost like everyone had deserted town, so i stopped in the middle of the highway and we both got out of the car to see this wonderment. I will never forget it. And just like that, it ended and we got back in the car and finally got to our Airbnb in Mvatn. When we arrived, we’d see faint green lights in the sky and because this got us all excited, we stayed up until 3am standing outside in the freezing cold, patiently waiting for Aurora Borealis to show itself again. It wasn’t as strong as what we had first seen earlier in the night. My photos of Aurora Borealis didn’t come out the best. Ultimately, we gave up and went to bed. We had many plans for Mvatn. We planned to hit up another lovely hot spring , the Mvatn Nature Bath, and because we are such huge Game of Thrones fans, we wanted to see the cave of Grjótagjá (another hot spring). This is where Jon Snow lost his virginity y’all!! SADLY, both places were closed due to the insane weather. I can’t tell you how disappointed we were, especially about the cave. Mvatn is such a small town, so getting to either hot spring would have only taken minutes. But mother nature took her course. We spent that entire day milling about at a very cute nearby cow farm/cafe/gift shop. (They make their own cheese there!) And to make things worse, we had to stay one more night in Mvatn than intended because of road closures. This is how bad the snow was, people! We were not the only ones whose itineraries were affected. Our host’s incoming guest also had to cancel and we had to cancel our night in Flúðir. Our Airbnb host was extremely kind vowed to help us whether it meant staying there for an extra night or helping us find another place to sleep. I believe all people of Iceland are very helpful and kind. We spent our last nights in Reykjavik. It reminded me of being in a ski village like at Whistler Village in Canada. I loved this city and wish I could have spent more time there. We did try the world famous lobster soup at Sægreifinn where you can also try shark and whale meat if you’d like… They also have all kinds of fresh fish. It was amazing. 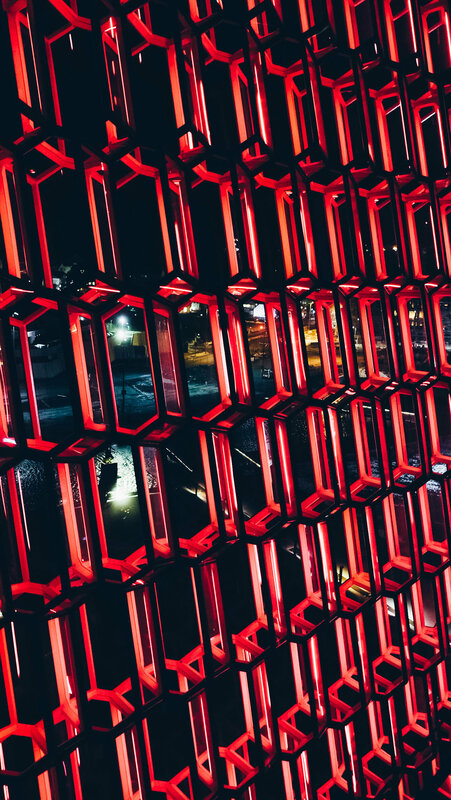 We also spent the evening at Harpa Concert Hall to roam around the very modern architecture, even though there were no exhibits open or concerts happening. We just spent a lot of time there exploring and photographing. What can I say? We’re easily entertained. This was one of my longer posts but a lot happened and I needed to unload my memory before I forgot. I’m looking forward to another adventure in Iceland. I have really fallen in love with Morocco. There is so much to see, especially outside of Marrakech. It is a country rich in history, beautiful in scenery, and so peaceful. The food is also extremely delicious and fresh. Spending one week there was not enough to see everything but enough to touch on the major highlights. I've had a few friends ask me whether I felt safe there and if I traveled in a group. I felt very safe in Morocco, particularly outside of Marrakech. However, if you are a woman traveling alone, I do recommend having at least one travel companion. It is the dark alleys (of which there are very many) in Marrakech in the evenings that felt sketchy. I try to avoid tour groups as much as I can. In this case, I was celebrating a bachelorette party with a few of my girlfriends, so it wasn't so bad but we made sure to always know where we were going and had maps saved on our phones. I was the navigator of our group. Because I often travel alone or with a friend, I am used to figuring out public transportation on my own. It often isn't difficult unlike New York City's public transportation system. However, this time, my friends and I hired a private driver who also acted as our tour guide for the entire trip. I cannot say enough good things about him (Hassan) and his company (Agdez Adventures). While there are trains and buses that can transport you between cities, having a private car may be the more expensive option albeit a very convenient one. If I had to take a bus or train though, I would opt for a bus (particular a tour bus) mainly because I have heard that trains can be very slow. There is so much more to see beyond big cities like Marrakech and Casablanca. The problem is that these small towns are very far and driving there, depending on your location, can take anywhere from 4 to 10 hours. The scenery along these routes are breath taking and makes the drives easier to endure. We saw massive gorges, valleys, mountains ranges. Our driver was completely trustworthy - he took us to all the must see places (time permitting) and was honest with us about places he did not recommend to visit and whether he felt it was safe for us to be out at night. He truly is the best (plug: he's given tours to the former Prime Minister of Morocco and supermodel Rachel Hunter!). Our least enjoyable experience were the many racist remarks thrown at me and my Asian American girlfriends. The amount of "ni hao's", "konnichiwa's", and "sayonara's" hurled at us was more than in any country I've ever experienced, including in the US. But it did not come from a hateful place. In fact, it was very harmless. They primarily have had Asian tourists from China and Japan, so it comes from a place of not knowing about other different Asian cultures and ethnicities. When I travel and I am asked where I'm from, I always respond "the US" and when people pry ("but you don't look American" or "where are you really from"), I empathize and tell them of my ethnic descent. People will not learn unless they are educated. So that's what we did - we told them what our ethnicities were. This mainly happened in the more crowded, big city of Marrakech. In general, the people there are very friendly and we never felt threatened. Casablanca should just be treated as an airport hub. It is often cheaper to fly into Casablanca than Marrakech so many people fly in and out of this city. Unfortunately, there is not much to see there. It is a financial hub with skyscrapers. Most people will just visit the mosque and venture off to Marrakech and other more interesting towns. I didn't even stop to see the mosque myself, simply due to lack of time. Marrakech, on the other hand, has a lot more to offer. The street food offers authenticity and there are many museums and a few gardens to visit. The mosques there are only for Muslims so we were not allowed to enter. Museums are small but I found the La Maison de la Photographie to be the most fascinating. The leather tannery is very interesting but it is in one of the poorest parts of the city so be prepared to be harassed for money. There is a building off the tannery that sells tons of leather goods and is very intersting to see. Just make sure the leather good you buy is completely treated (hint: make sure it doesn't smell both inside and outside the bag) and ALWAYS bargain - start on the low side even if it feels uncomfortable. Don't pay more than 50% of THEIR asking price and generally you can only bargain if there isn't a listed price. The Majorelle Garden, aka the "YSL Garden" is a must visit, especially if you are a fashion fan. Late fashion designer, Yves Saint Laurant, and his partner Pierre Berge bought the garden in 1980. There is a memorial for the designer in this very pretty garden as well. Jemaa Elfna is the main square that is alive at night. It's filled with street entertainers and food vendors but if you even attempt to capture the acts on camera, you will be aggressively asked to tip. Food in this area is OK. I recommend the hole in the wall restaurants (Oscar) or street vendors in residential neighborhoods over those in the square. Those in the square also often over charge ($4 USD in the square vs $1.50 USD in residential areas). There are also Henna artists insistent on drawing a henna on your hand. The products they use are usually natural free of chemicals, but only leaves a faint red mark afterwards. The designs are also VERY different from Indian hennas. I personally prefer Indian henna, so you can leave this off your to do list. Chefchaouen, the Blue Pearl as it is known, is a magical place. Its history includes Jewish settlement from European countries as well as a heavy Spanish influence, even though the country as a whole is known for its French influence. So those in this very small town speak primarily Arabic and Spanish. Initially, doors were painted blue to identify Jewish residents but eventually became a trend and the entire town was painted blue. The extreme cleanliness of the city also struck me - alleyways are often free of trash and every evening a sweep happens. Needless to say, Chaouen (as locals call it) is a very photogenic city. A local restaurant called Sophie's came highly recommend to us. Unfortunately, we did not have time to enjoy a meal there. One of the many highlights was the Sahara Desert. This was definitely one of the longer drives lasting about 8-9 hours from Marrakech but there were many scenic stops to and from here. They include Drai Valley and Gorge, Todra Gorge, driving through the Atlas Mountains, Ouarzazate, Rose Valley, Ai Ben Haddou Casbah (Gladiator's opening scene was shot here) and we also stopped by Hassan's mother's home for a home cooked lunch (the BEST cous cous I've ever had). Essaouira was our last stop before flying out of Casablanca. I did not expect much from this coastal town but it definitely charmed us unlike the other ones we visited. It is a big fishing town, known for its seafood and is quiet, quaint, and much more laid back than Marrakech. And for some reason, souvenirs were the cheapest here than other places we visited. I highly recommend staying at least one night here in a riad. For the fans out there, scenes from the Game of Thrones were shot here. It definitely has an "ancient" vibe to it because many of its old structures still stand. The coastal drive from Essaouira up to Casablanca is also gorgeous and a much different terrain than the inland routes we had been taking for most of the road trip. Unfortunately, there was not enough time to see some of the other interesting and historical places we had heard about like Fez (the country's "cultural capital") or Tangier (the Moroccan part of the gateway between Africa and Europe). I definitely want to make another trip back to see these places and spend more time in Chefchaouen and Essaouira. My last stop on my Asia tour was Malaysia. This is the second time I've been to Malaysia since 2008 and instead of only visiting Kuala Lumpur, I also checked out the beach city of Penang. One of my good friends from college who is a Malaysia native hosted me in her home (for the second time) while in Kuala Lumpur (KL). KL is much like any other modern, big city and since I had already been before, the highlight was Penang. But no matter where you go in Malaysia, and this is what I remember most from my first trip, I've had some of the most amazing and delicious food in this country. The multicultural influences from the three main ethnic groups that inhabit the country (Malay, Chinese, and Malay) all make for some very memorable meals. While KL is modern, there are definitely "night market" type places like the Petaling Street Flea Market and hawker style/street food vendors. The Petaling Street Flea Market was interesting to walk through but there isn't really anything worth buying unless you are looking for cheap, tchotchke souvenirs. I preferred Hong Kong's night market much more which also sells cheap, tchotchke stuff. But of course, hawker food and hole in the wall restaurants are incredible. Again, you can find very authentic Malay, Indian, and Chinese restaurants all over. I loved going to hole in the wall Indian restaurants - they're literally everywhere - and most will offer buffet style Indian food. In some places, you can watch roti be freshly made on the spot by hand. And Malaysian Chinese food is so much more flavorful than most Chinese food ever I've had, even in China. The new thing I did in KL was actually go up to the bridge and observation deck at Petronas Towers downtown. It's best to buy tickets ahead of time they only allow a certain number of people in at a time. So you can buy tickets for different time slots so purchasing tickets in advance will save you a lot of time. The view was nice and you are up high (the observation deck is on the 86th floor) but it is a typical tourist experience. Public transportation is convenient and easy to figure out and buses are free once you are in downtown.Traffic is horrendous but if you are able to take advantage of Uber, it's UBER cheap (pun intended). This also applies to Penang - in Penang, I took Ubers everywhere and never once rode a bus, which is what a lot of people do. There is absolutely nothing wrong with buses, but I'd often find Uber receipts for likes than $5 USD for half our long rides! Some rides were even less than a $1 USD. If you ever go to Malaysia, PLEASE add Penang to your itinerary. It reminded me a bit of Hawaii and is 10 times better than KL. There are familiar hotels that line the beaches. The most secluded and nicest part of the beach is called Batu Ferringhi. It's also near the big night market, which is not anything to write home about. However, the food at the night market was awesome. The further east you go, there is another large hawker style food market that is equally good. If you go into town to Georgetown, you'll find all kinds of things to do there. I highly recommend China House - they're known for they're super yummy cakes made of different kinds of exotic food (if I could only go back!) and they also serve regular food which was also very delicious. It's an awesome place to explore because you think the entire place is one restaurant but it's made up of multiple restaurants, cafes, art shops, and even a bar in the back with live music. I loved the randomness. Within the China House complex next to the restaurants was an extremely cute clothing boutique curated with lots of Korean made clothing and accessories. The decor was very simple with plenty of succulents and air plants. The place reminded me of a Kinfolk magazine. Needless to say, I walked away with some very cute, affordable items without intending to. One thing many people don't know is that luxury shoe designer Jimmy Choo is originally from Penang, Malaysia. The shoe store where is apprenticed at is still there and is called Hong Kong Shoe Store. It's small and they still make custom shoes. There are pictures of Jimmy and some of his shoes (questionable whether they are really his designs) sold there. Definitely a cool place to see where he got his start. Street art is also everywhere in Penang and it's fun roaming the streets looking for them. When you find one where there aren't so many tourists crowded around it, you feel so proud like you've found a secret treasure. Within Georgetown, you can also walk through the floating village, get henna drawn on your hand in Little India, and eat the most amazing food at all the restaurants and street vendors that occupy the streets. One thing Penang is known for is White Coffee - sweet and very delicious coffee. There are temples all over Penang but I highly recommend Kek Lok Si - it's massive and said to be the largest Buddhist temple in Malaysia. I also made a day out of Penang Hill. Penang Hill is made up of a group of peaks and makes for a very nice view of the city. To get up to the hill, you must purchase a ticket to ride the tram up OR you can rough it and hike up but be forewarned, the hill is steep. I originally was going to hike up but was dropped off at the wrong entrance so I ended up "tramming" it up like everyone else. I have to say, this place is VERY touristy, which was a turnoff for me. What is cool though is that there is a Hindu Temple and a Mosque at the top. To get away from the touristy experience, I decided to hike all the way down and I'm so happy I did. I may have passed about 8 people along the way with most walking up. And apparently there are 2 routes down and one of them is a truck route, which I've read is not recommended because it is the "boring route." I think I took the truck route BUT I saw so many monkeys! Had I not hiked at all, I wouldn't have seen them. At one point, I stumbled upon a station that looked like a place where locals hang out and possibly live at and all the monkeys in the forest seemed to congregate there. I saw a pregnant monkey and mom monkeys with their children hanging on to them as they walked. It was definitely a highlight that day. I think most people are afraid to try new things, different foods, and take risks when they travel. I'm probably one of the biggest risk takers travel-wise and my love for food makes me an adventurous eater. But I would not have had all the amazing food I've had and the most unique experiences had I not (safely) taken my chances. So I encourage you to do the same! After Hong Kong, I left for Vietnam. Out of all the Asian countries I ventured to on this trip, I was most excited for Vietnam. I was looking forward to the amazing food and speaking Vietnamese the most. Vietnam is actually the first foreign country outside of North America that I've visited. I was a teenager with my family visiting relatives in Ho Chi Minh City. This time, I explored northern Vietnam (where I have no relatives) and spent a week in Hanoi, the capital of Vietnam. I also made a 2 night excursion to Halong Bay. Northern Vietnam is more low key and less "city" than Ho Chi Minh City, which I loved. My friend and I stayed in Old Quarter, the heart of Hanoi, which is made up of narrow streets filled with street vendors (oh the food!!! ), souvenir shops, coffee shops, and french influenced architecture. There is definitely a chaos to the city. Crossing the street alone is adventure as motorbikes are plentiful and traffic lights are not. Knowing the language also gave me a huge advantage - it helped me get better deals when bargaining and got me into museums for free! Vietnamese coffee (ca phe) is also a MUST. Ca phe is made using medium to coarse grown dark roast Vietnamese-grown coffee with a small metal Vietnamese drip filter (phin) and sweetened condensed milk, which is basically sugar and milk. It can be served hot or iced. Egg coffee is also widely served across Hanoi cafes with the most famous cafe being Giang Cafe. It's ca phe with the addition of egg yolks which gives it a creamier texture. It is quite delicious! If you want to buy a phin and Vietnamese ground coffee, the most popular brand is Trung Nguyen. Trung Nguyen has cafes throughout the city and they sell both their own brand of coffee (packs you can take home) and phins. Dong Xuan Market is a large, well-known market in Hanoi in the Hoan Kiem district. You can find tons of vendors and stalls with all kinds of souvenirs and snacks like dried fruits, nuts, candies. My favorite part about the market is the food court! It's actually not even inside the market. You have to walk out the back of the market across the street and straight onto a very narrow walkway. It is lined on both sides with vendors and tiny restaurants selling the most amazing Vietnamese dishes. Some of them specialized in just one kind of noodle dish or only desserts. We picked a very tasty noodle place but every single one of them looked amazing. Halong Bay is a beach town about a 4-5 hour drive from Hanoi, depending on how fast your driver is. There are no trains in the area so the only way to get there is to have someone drive you by taxi, coach bus, or a hired tourist van. Most tourists will book tours from Hanoi that will include van transportation and activities to and in Halong. This is what I recommend for everyone who visits. I was adventurous and went with a very local and budgeted experience since I know the language. My friend and I took a bus from the Hanoi Bus Station, which only cost us $5 USD each. But we took a taxi from our hotel in Old Quarter to the station and as soon as we got there, the chaos was in full force. With everyone pouncing at us to attract our business, I accidentally dropped my cell phone in the cab as we were leaving and didn't realize it until we got onto our bus. For the rest of the trip, I didn't have a phone and this was only day 3 in Vietnam. I didn't let it get to me because at least I still had my cameras! Halong was very beautiful but expensive compared to Hanoi because it's kinda in the middle of nowhere. And not everyone speaks English in town. Seafood was amazing there but you have to haggle with restaurants on prices which I thought was strange. Beaches are pretty and the scenery is gorgeous but I didn't get to go to the famous Cat Ba Island. Had I planned the trip better, I would have booked a tour to Cat Ba Island from Hanoi. Something I'll do the next time I'm back!